Good morning everyone! How was your weekend? Ours was the same busy kid activity filled weekend plus a good dose of college football. The fun Fall weekends that we've come accustom to! And our weather was absolutely gorgeous, so we spent a lot of time outside soaking it up. 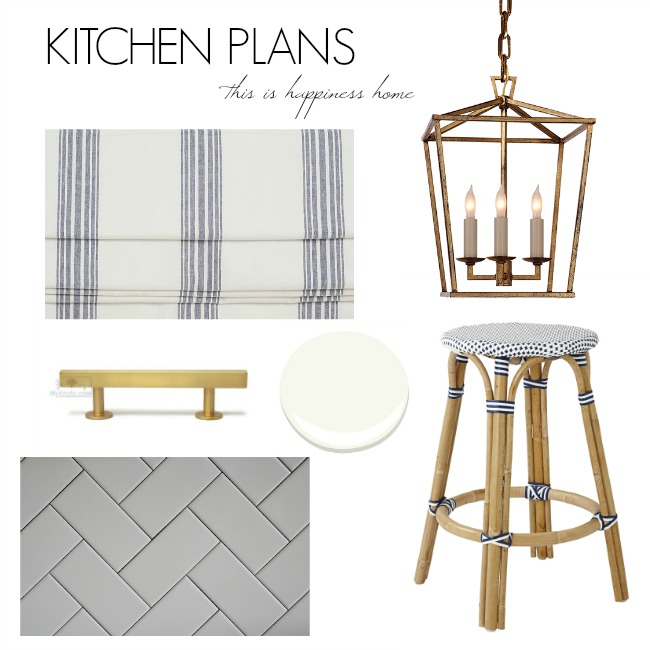 Today I wanted to share a little about our kitchen plans. I have been so anxious to redo our kitchen ever since we moved in. When we moved in May, we had all the walls and ceilings painted and I picked out paint for our kitchen cabinets. The painters painted all the walls one weekend and then they were supposed to come back the next weekend and do the kitchen cabinets, but I had them hold off. Here's why - our cabinets our currently painted a dark brown almost black color, so I was hesitant to paint over them again especially a white color. So we started toying around with the idea of replacing them. I also wasn't sure if our granite would pair with the white cabinets and still give the kitchen the white look I wanted. So we thought replacing the cabinets and granite would be the way to go. But once we started down that path, it snowballed into also doing the floors because the new cabinets may not line up exactly, which then lead to if we do the floors in the kitchen, we really needed to do the whole downstairs so it would all flow. And then some of the appliances would need to be replaced and so on and so on. So I kind of put the kitchen on the back burner and we carried on with our other projects, which were mostly outside this summer. Then a month ago, I had a girlfriend over and shared my thoughts on our kitchen and her response was why not just paint the cabinets now, even if you know one day you want to remodel the whole kitchen and do the floors. She knows that I love a white kitchen and she said that it's better then living with the dark cabinets, until you're ready to do the full remodel. Yes it is! Riviera Stripe Cordless Roman Shade in Navy - I've always wanted a window in the kitchen and we got lucky with one in this home. I have plans to frame/trim out the window and then add a window treatment. I love Roman Shades and this casual navy striped shade will pull in the blues I'm using in our family room which opens up to the kitchen. Darlana Mini Lantern in Gilded Iron - I have been pinning several white kitchen images lately and there is always one common denominator in them - gold finishes. So I knew when we painted ours, I would be adding some gold finishes. At first I thought our kitchen island was too small for the size pendants I was finding. But then I came across these and I think they will be the perfect size. Brushed Brass Pull Bar - Excited to add these to the cabinets to tie in the lanterns. Simply White by Benjamin Moore - A fresh, white color for the cabinets. Our walls are painted Palomino Gray by PPG, which is a very, very light gray (almost white) color and I think this bright white color on the cabinets will look great against the walls. White Subway Tile Herringbone Pattern - I love classic white subway tile. Thinking about installing it in a herringbone pattern to change it up a bit from our last kitchen. Riviera Backlless Counter Stool in Navy - I have been in love with the Riviera style barstools and chairs ever since Serena and Lily first showcased them. Because our island is smaller size, I'm thinking 3 backless barstools will be a better fit then two with backs and three will off set the two pendants. When I put this design board together yesterday and I saw everything grouped together it made me so happy! Besides painting, we will be doing the backsplash, lighting and hardware installations ourselves so hopefully by the end of the year we will be finished. I would love it all done by Christmas, but we'll see. At least there is a plan. Having a plan and vision is a good thing. Have a wonderful day! Love what you want to do with the kitchen. We're ready to paint our cabinets white and just need to find someone reasonably priced. Thanks Tiffany! Good luck with yours. So happy my kitchen could provide you a little inspiration. Good Luck on your kitchen facelift. I am sure it is going to be beautiful! Thank you Sita! I absolutely love your kitchen!! It's definitely my inspiration kitchen. I can see why you would be hesitant to paint the cabinets at first, but it sounds like you are putting a plan together for your project. You may even be able to save a little money since you do not have to replace the counters and floors. You picked out attractive items in a beautiful color scheme, and I am excited to see what your kitchen looks like after the remodel.